Pressure reducing valve stations are often installed utilising a main valve(s) with a smaller bypass valve installed in parallel to handle the low flow requirements. Whilst determining the set pressure of the smaller valve can often be estimated using the pressure loss charts, due to these charts being produced under certain operating parameters, the curves that are shown may vary depending on inlet and outlet pressure conditions. Therefore, the actual pressure loss should be verified on site. Every project is different and even floors in the same building may be different. For example, a pressure reducing valve pressure loss curve may be shown with an inlet of 800kPa and a set pressure of 500kPa, but if your pressure reducing valve station has an inlet of 900kPa and a set pressure of 300kPa, then due to the larger pressure differential these pressure loss curves will shift and therefore your set pressure between your main valve and the bypass valve may also change. To correctly identify and commission the set pressures of your main valve and low flow bypass pressure reducing valve, there are some simple steps that can be followed on site to ensure they are working at their optimum levels. Set small bypass valve first. Ensure a gauge has been installed on the small valve. Set the small valve to 500kPa under static, no-flow conditions.. Note: if reducing the pressure down from a higher to a lower set pressure, you will need to relieve some pressure by opening a tap periodically to read the pressure setting. 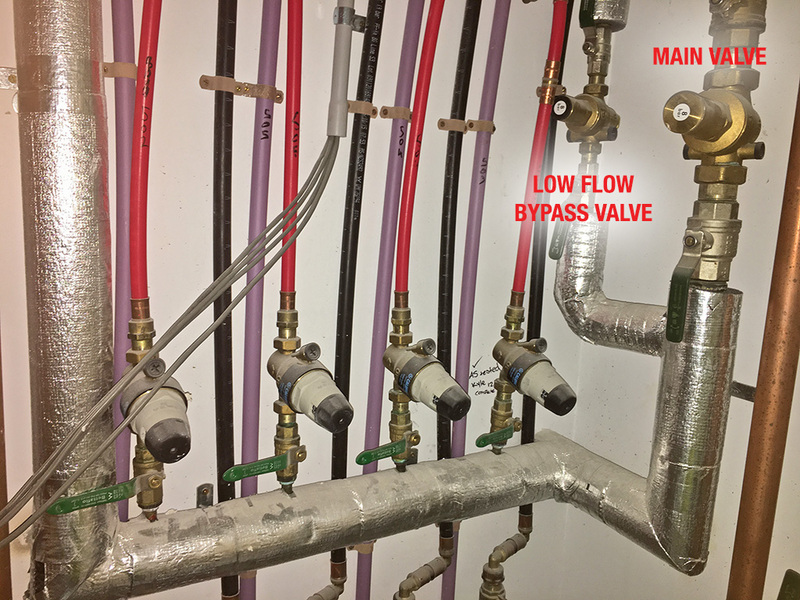 Identify pressure loss of bypass valve at minimum flow of larger valve. Keep small bypass valve open and keep the larger main valve closed. Open enough fixtures to simulate the minimum flow rate required of the larger valve, ie 18 l/min which could be 3 fixtures. Note: if setting hot or cold water, ensure that full flow is provided for the hot or cold line being set and not mixed through a flick mixer. Ensure a gauge has been installed on the main valve. Note: if reducing the pressure down from a higher to a lower set pressure, you will need to relieve some pressure by opening a tap periodically to read the pressure. Valves are now set correctly to handle low and high flow requirements. By the way, if you're curious about the above setup; it utilises a 32mm 536 series and 15mm 536 series high pressure models of Caleffi pressure reducing valves as a 1st stage pressure reduction, reducing from 1,400kPa to 740/800kPa (main/bypass) and then the individual PRVs off the header manifold are 15mm 535H series Caleffi pressure reducing valves to reduce from the 740kPa to 350kPa to each individual unit.